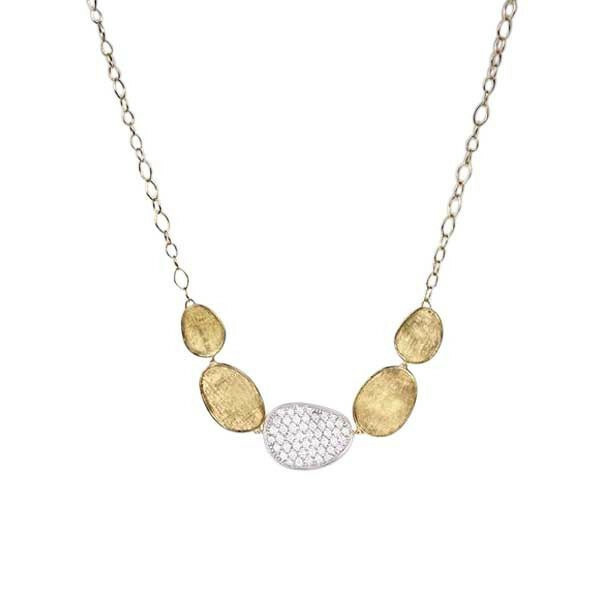 From the Marco Bicego Lunaria collection, this diamond necklace is an enticing piece of jewelry. This 16.5" link chain has a five leaf station. Four of the leaves are crafted in 18kt yellow gold and are finished with the Bulino technique for a soft, brushed look. The center leaf is fabricated in 18kt white gold to pop the diamonds that adorn its surface. This Marco Bicego necklace will elevate the outfit you pair it with in sumptuous style.